Rakusan did not include the Fan Series in his main sequence numbering. Therefore, the original number used for each of the 36 Series prints has been modified to identify the Fan Series members of its theme. The five different fan silhouette shapes have been here assigned arbitrary numbers 1 through 5. To indicate a fan design these shape designations are added to the 36 Series number separated by a hyphen. 135-3 is the Fan Series design with fan shape 3 in the 135 Freshwater Fish theme. Like all other designs in this series, 135-3 was only produced in a single print run, and few copies are currently documented. The 135 Freshwater Fish theme is one of the many entirely regular themes represented by a complete fan quintet and a color woodblock print. 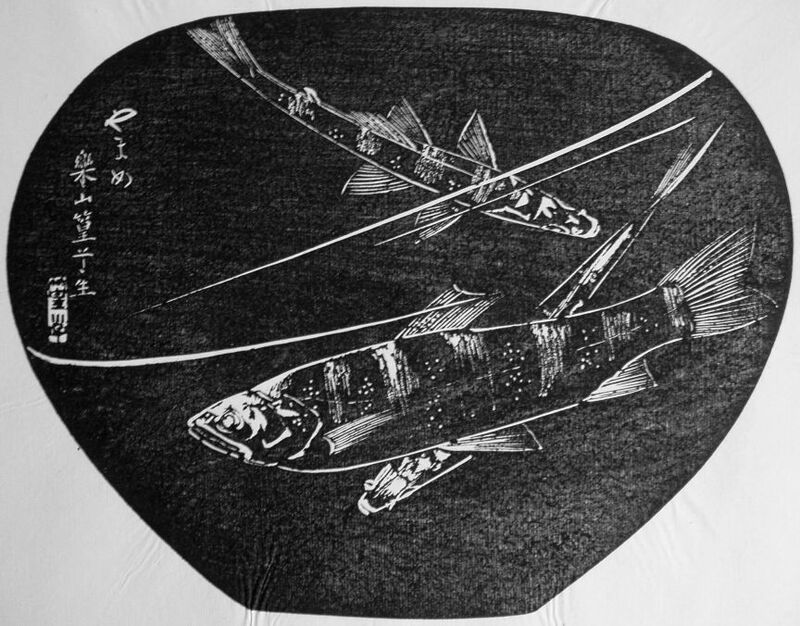 The Fan Series designs of the 135 Freshwater Fish theme are unique in that each has a title naming the illustrated species which is incorporated into the composition. However, 135 (like all 36 Series designs) has no original title. Although, more generally described here simply as freshwater fish, it should be noted that all of the named fish are commonly eaten, and several are commercially farmed. The Fan Series prints of the 135 Freshwater Fish theme were distributed in early 1935 in installment twelve (of twelve). The delivery documents for installment twelve remain to be discovered. The series as originally announced would have seen this last installment published in December 1934. However, with documented delays the earliest month it could actually have been delivered is March 1935, and it may well have been even further delayed. Four of the five fan designs in this theme (including 135-3) have seal C which indicates a carving date during the first half of 1934. The remaining fan design (135-1) has seal R which is a rare minor seal whose carving period has yet to be established. Despite the early completion of its wooden blocks, Rakusan delayed printing and distribution of the prints in what became the 135 Freshwater Fish theme until the following year. It was eventually grouped with other summer season themes at the end of the series. Use of seal B on the 36 Series design 135 suggests it was carved at least a bit later than the fan prints. 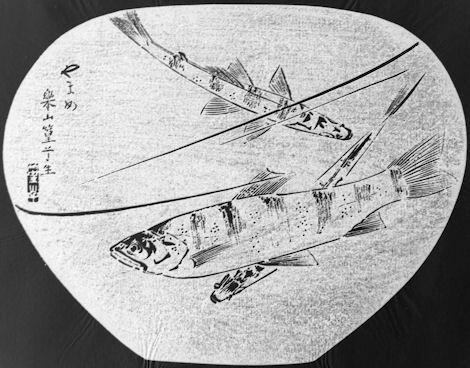 The composition of 135-3 shows three salmon rendered as detailed line drawings which look equally well as ishizuri or reversed. Three very abstract curved lines superimposed on the fish indicate that they are alive and swimming in the water. Two of the fish are seen from above, and the third from the side to ease recognition of the kind of fish. Just to the right and above the signature and seal in upper right, Rakusan has incorporated a title, やまめ, yamame, 'landlocked masu salmon'. Cherry Salmon (Landlocked Masu Salmon), Oncorhynchus masou, 山女, やまめ, ヤマメ, yama-me, lit. 'mountain-woman' is an edible species of freshwater fish.